Cleaning your kitchen without plastic may seem impossible. Plastic bottles of dish soap, plastic-wrapped sponges, plastic-wrapped paper towels… the list goes on. But its actually quite easy to clean your kitchen without plastic. Its cheap too. Here are the things I use to clean my kitchen without plastic. I use powdered dishwasher detergent instead of liquid detergent in plastic jugs or those little gel tablets in plastic boxes or bags. I’m using Seventh Generation right now. It comes in a recycled paper box. Baking soda is great for cleaning. I use it instead of powdered cleaning products like Comet or Ajax. Baking soda works very well and is able to cut through greasy messes really effectively. Just use it like you would a normal powdered cleaning agent. I used baking soda to clean my super greasy kitchen sink earlier today. Now its shiny and clean. Plastic spray bottles of cleaner are filled with chemicals. They’re also expensive! You can make your own plastic-free, chemical-free cleaner yourself, and it will only cost you a few cents. 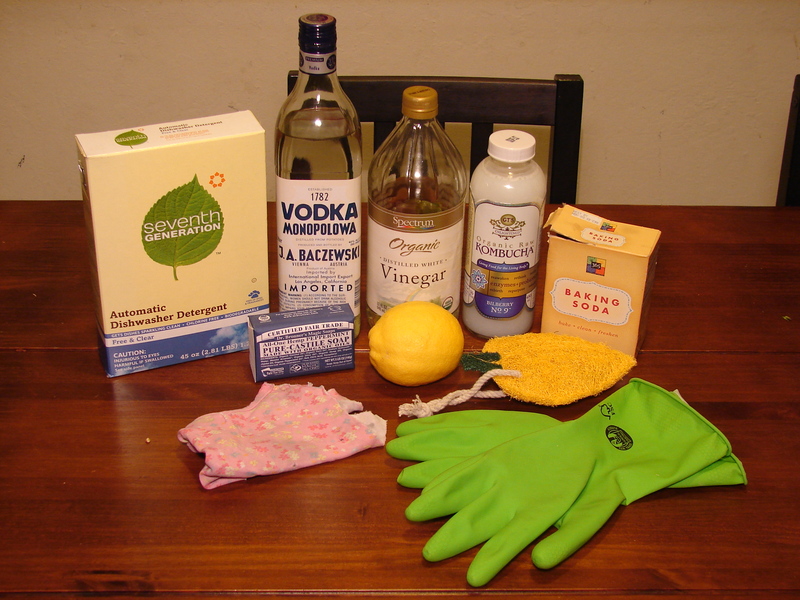 I make a cleaning solution using one part vodka or vinegar to two parts water. I use this on countertops, appliances and my stove. You can also use this to clean your fridge. Unfortunately, the vinegar I got has a plastic lid. The vodka has a metal lid though. I’ll reuse both bottles. I don’t use deodorizing drain cleaners in plastic containers. If my sink smells, I put a lemon peel down my drain and run my garburator. Then my sink smells lemon fresh. You can use plain bar soap to wash dishes instead of buying dish soap in plastic bottles. You can also make your own plastic-free liquid dish soap if you don’t like washing dishes with bar soap. I did this a couple days ago using this method. I stored my homemade soap in old glass and plastic bottles I had lying around. (The bottle next to the vinegar is filled with my homemade dish soap.) Personally, I prefer bar soap to homemade liquid soap for washing dishes. But the liquid soap works too. I just got a loofah kitchen sponge yesterday. Most kitchen sponges are made of plastic. You know how after a while they wear out and pieces fall off? Those pieces that have fallen off have been washed down the drain. I never thought of this until today when I looked at one of my old kitchen sponges which is falling apart. The loofah sponge I got is a brand called Loofah-Art. Unfortunately the packaging was not completely plastic-free. There were two little plastic tabs attaching the loofah to a piece of cardboard. Apparently this loofah sponge will last ten times longer than most kitchen sponges though, so its still a much better option than plastic sponges. The other thing I like about this loofah is that its gentle enough to use on things I would use a soft sponge on but also tough enough to use instead of a plastic scouring pad. Instead of using plastic sponges on my counters, I use rags. I cut up old t-shirts into rags once they get too ratty to wear. I don’t use dish gloves in the kitchen, but my mum does. Unfortunately, a lot of dish gloves are made of plastic. I found some natural latex gloves recently from If You Care. The lining is cotton (no synthetic petroleum-based fibers). The gloves were in a recycled paper box. Hi Shanna! I love your ideas! Have you ever looked into Norwex cleaning cloths? I love them! I use them to clean without chemicals. So worth it. Saves money (no chemicals and washable) and time (works so efficiently)! They are kinda pricey so worth it!!! Great post! I realize I’m coming to this party a little late, but I thought I’d mention that you can actually grow your own luffa plant (and that luffa, before it gets all loofahish, is even edible)! ~ North Woolwich Carpet Cleaners Ltd.